Movie 5 Greek. Archelon is a type of giant ancient turtle. Ganimon + X With his solid body, the the high pressure of the deep ocean doesn't bother him a bit! Has the power of "underwater"
If you lose the battle you can take three cards from your opponent's Net Ocean and send them to the Dark Area. 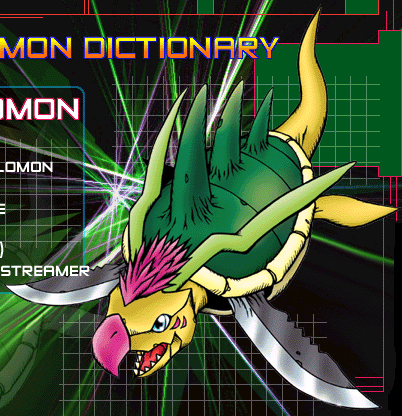 Wormmon + Digimental of Faith This Armored Digimon has a super hard shell. His sharp fins and shell are feared throughout the ocean! Has the power of "underwater"
With each Digimon card you discard from your hand, your opponent's attack power decreases by 30 points. Muchomon + Win Ratio 40%!